Type of jet: With so many brands to choose from, it’s important to familiarize yourself with the different types available and settle on one you like. Cost: The next question you need to answer is how much it’s going to cost, and if it’s within your budget. Size: Then ask how big of a jet you need; like their owners, jets come in different shapes and sizes, and it will most definitely end up affecting the price! Luxury level: Private jets are known for their luxury, and there’s a huge range of luxurious add-ons you can choose from. You need to consider what level of luxury you want from your jet, and what you can expect to pay for it. Extra comfort: If you want your jet to be extra comfortable, or you want to customize the jet to your taste, this will also affect the price. Fuel prices: You also need to consider the amount of money you’d be spending on fuel with different models before you settle on one. Cabin crew: You need to think about whether your cabin crew will be employed permanently or contractually. This will depend on your needs and your budget. Maintenance fees: Consider how much maintenance fees will cost you. For your safety, and your passengers, regular maintenance is absolutely vital, and a cheaper plane might actually end up costing you more in the long run. Insurance: Take a look at the various insurance plans out there and what you’ll need to cover. While you’ll hopefully never need it (and probably won’t), it’s an absolute essential if you’re considering owning a private jet. Repairs and damages: Factor in how much repairs are likely to cost. Just like a car, there are a ton of different components to consider in a jet, and potential problems can end up running up a rather large bill. Catering: You should consider whether you want catering available onboard. If so, are you going to use a restaurant, hire a professional chef, or hire an outside catering firm on contract? Personnel and staff: You might need more staff than just a cabin crew, so consider the personnel and staff that you’d need to employ to meet your needs. Budget: How much you are willing to spend in total? Payment structure: How are you going to pay? Can you pay in installments or does it have to be all at once? Deals: Always, always, always ask if there are deals available! Vendors want your business after all! Leases: Lending out your jet can be a great way to balance your budget and raise capital. Private jet chartering: Don’t have the capital, but still want to travel in style? You could always consider private jet chartering as a more cost-effective alternative. Other expenses: Miscellaneous expenses are bound to show up, so budgeting for your personal needs is a wise decision. Personal value: It’s important to consider whether or not there is enough personal value to invest in a private jet for you or your business. When to buy: Make sure you have all the information you need to make an informed decision, and ensure that your finances are solidly in place before you purchase. There you go! 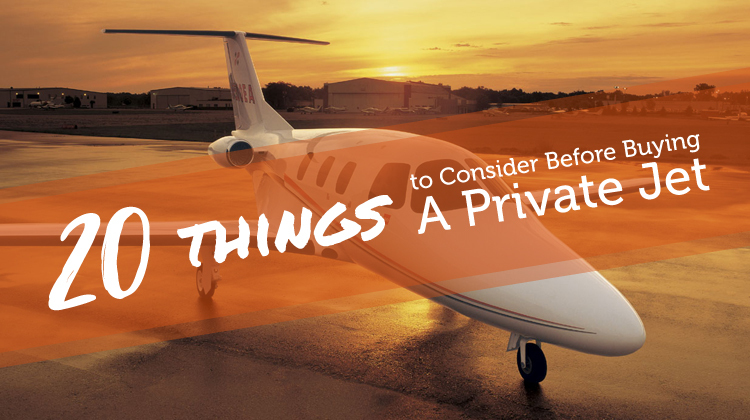 With this list in hand, you can help narrow down exactly what you need before you continue the purchase of your own private jet.